Mass on a Sled | THERMO Spoken Here! The sketch (right) is from a physics text. 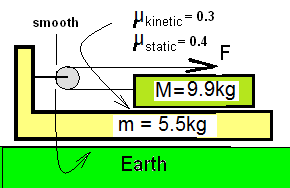 According to the drawing, there is one horizontal force that acts with magnitude, F, directed to the right. The implication is acceleration of masses m and M occurs "at the very instance" of observation. Calculate: The greatest force such that NO sliding of the mass on the sled will occur. take the dot product of the equation with "I". The unknown terms are: “F” and “d²X/dt²”. In Eqn (1) the acceleration is not known and the force magnitude is not known. The event occurs in the "X"-direction so the Second Law yields only one equation. Therefore we one equation and two unknowns ~ insufficient information to solve. We must analyze a smaller system. (2)The unknown terms are: “F” and “d²X/dt²”. (3)The unknown terms are: “F” and “d²X/dt²”. (4)The unknown terms are: “F” and “d²X/dt²”. ♦ Sometimes a question regarding a system with its dynamics "in progress," can be answered without any understanding whatsoever of the initiation of that "progress." Skilled persons can answer these questions. Whoever wrote this physics problem did not see the event get started. In classical mechanics (some manner of) initiation can be prescribed. For beginners, to be able to construct how the event began (or might have begun) is helpful. The sketch is an "expanded version" of our "physics problem." I show one possible "initial condition (above right). All matter of that "initial condition" has zero acceleration; everything moves at SOME constant velocity... the easiest constant velocity is ZERO velocity; everything is at rest relative to Earth. In this sketch I post pone addressing friction by representing it as a "shear pin." Explanation (to be provided later) is missing. The sketch is from a physics text. According to the drawing, there is one horizontal force that acts with magnitude, F, directed to the right. The implication is acceleration of masses m and M occurs "at the very instance" of observation.